These stark and shocking statistics highlight the unacceptability and injustice of domestic and family violence, meaning we need a fresh approach based on not just mitigating its effects but stopping it in the first place. According to a 2010 NSW Auditor-General’s Report ‘Responding to Domestic and Family Violence’, domestic and family violence is estimated to cost the NSW economy more than $4.5 billion each year. The Greens NSW plan recognises the critical importance of investment in primary prevention of family violence that impacts the psychological and physical safety of women and children. Appointing a Minister for the Prevention of Domestic and Family Violence tasked with ensuring integration and coordination across government agencies, the community sector and the justice system. Investing in violence prevention initiatives across all parts of society – communities, schools, workplaces, businesses, sport and recreation settings, and the media. Funding targeted education programs in schools from early childhood to high school to build awareness of gender stereotyping, inequality and attitudes that encourage violence. Funding community and workplace based initiatives to prevent violence and foster respectful and equal relationships between men and women. Funding specialised services to support men and boys who are at risk or have a history of violent behaviour in domestic and family situations to acknowledge and change behaviour. Restoring funding and increasing to women-only specialist services, refuges and shelters, and increasing funding to these services in rural/regional areas. Investing in programs and services that meet the specific needs of at risk groups, such as Aboriginal, immigrant. Investing in trauma informed support services for women and children that support and enable healing, including accommodation and post-crisis services. Investing in skills development for community workers at the front line of supporting victims of domestic and family violence. A safe and supportive justice system. Improving the justice system by providing access to specialist family violence support workers, court staff and magistrates who understand the dynamics of family violence, and increase funding for free legal advice for women. We are particularly failing regional woman with 19 of the top 20 Local Government Areas (LGAs) with the highest rate of domestic assaults being regional, areas already suffering from a lack of services. While Premier Mike Baird is holding the inner city community to ransom with the redevelopment of the Cleveland St school dependent on his wires and poles privatisation, he is also quietly selling off the Bridge St Education Department headquarters, according to Greens NSW MP John Kaye. Dr Kaye said: “Mike Baird’s privatisation program gives with one hand and takes away with the other. “While the Cleveland St development will provide much needed additional high school capacity in the City’s south, the site that could provide for the next increase in student numbers is scheduled for sale to the tourism industry. “In NSW governments never learn from past mistakes. “At the very least, the Bridge St site should be kept in public hands to make sure that inner city communities don’t face another education capacity crisis in ten years. “The Liberal-Nationals’ pea-and-thimble privatisation game will take away public control over the future of the electricity industry and turn the obvious site for the next increase in student numbers into a luxury hotel. “The Greens congratulate the parents and communities in the Inner City who lobbied so tirelessly and effectively to force the NSW government to act. “However providing quality public education in Parramatta, Inner Sydney and across NSW should not be dependent on selling public assets. “Ensuring that the Intensive English Centre is moved to an equally accessible and appropriate location is also essential,” Dr Kaye said. The Draft Parramatta Road Urban Renewal Strategy has finally been released by UrbanGrowth NSW, thanks to political pressure. It is only on exhibition until 12 February 2015. The Strategy proposes overriding local planning controls and could impose high rise residential development of up to 25 storeys onto large parts of Leichhardt, Lilyfield, Annandale and Camperdown. The Strategy contains no public transport plans, no new open space for sporting fields and playgrounds and no new childcare centres, schools or community facilities to support the significant increase in population proposed. The timeline suggests that rezoning could start as early as next year. Councils have raised concerns about the poor quality of the high density development maps and the general lack of information in the strategy. Following exhibition until 12 February 2015, a report will be prepared by Urban Growth which will guide the development of more detailed rezoning plans for high rise development in the Inner West and West. 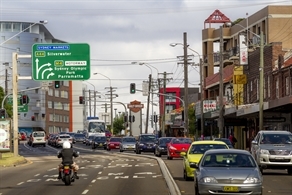 It is therefore critical to make a submission on the Parramatta Road Urban Renewal Strategy now. There is an online survey, however please be aware that this survey does not provide opportunity to respond to the proposed high rise development which is, in fact, the key issue. The survey limits its scope to some very general questions and to the aesthetics of Parramatta Road itself. Doing the survey alone is therefore not enough and it is important to also make a written submission. Written submissions should be sent it to: info@newparramattard.com.au. You can also visit in person at the New Parramatta Road Public Display Office. Urban Growth NSW team members can answer your questions and provide information at the display office. Building on the long history of walking for social justice – from Mohandas Gandhi to Martin Luther King – Sydney residents can walk to save our drinking water from being drained and cracked by mining exploration, starting on 21 February. The journey will begin at 10am at the Cataract Dam on Saturday February 21 and end at State Parliament at midday Saturday February 28. Anyone can walk for as little as half an hour or as long as they like. Greens candidate for Drummoyne, Alice Mantel will be walking on Thursday 26 February starting at Parramatta and ending at the Auburn Botanical Gardens. Coal seam gas (CSG) fracking is now taking place within 300m of housing in the Camden and Campbelltown regions. The walk will pass these areas on the first and second days. Most of Sydney is covered by Coal Seam Gas exploration licenses. These were temporarily frozen by the state government, but can be reactivated at any time. Apex Energy has a license near Warragamba Dam, and more recently the State Government’s Chief Scientist report could open the door to more fracking in Sydney’s water catchment. The NSW State government is dismantling Sydney Catchment Authority at a time when its expert knowledge on protecting drinking water from mining is crucial. In addition, the Federal government has offered funding to State governments as an incentive to privatise water. Premier Mike Baird welcomed this but has not yet publicly introduced the idea of privatisation. This could easily occur after the forthcoming NSW state election in March. Ms Mantel called upon Premier Baird to rule out any such privatisation. “Protecting the precious water reserves of NSW requires banning all coal seam gas mining and keeping all water in government hands in trust for the citizens of the state,” she said. Some of Sydney’s most reliable rainfall-fed drinking water sources have been cracked and drained by underground longwall coal mining, upstream from Woronora, Cataract, Cordeaux and Avon dams. The route will include stops to meet the Mining Minister, multi-cultural and multi-faith events and a rally to support Sydney Water employees.